Taller, wider and longer than the outgoing Isuzu Rodeo, this is it’s the replacement, the new Isuzu D Max. First shown in Thailand last year, it has now reached the UK and went on display at the CV Show this week for the benefit of British buyers. It’s not a full-size pickup in the American sense, which makes it OK for British roads, and will be available in three body styles – single and double cab, plus a new Extended two-door Cab, which still has five seats although the rear three are for very occasional use only. 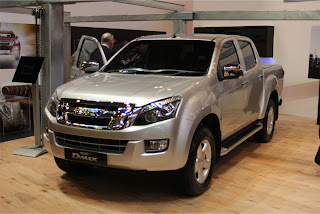 The larger dimensions make themselves felt inside with more leg and shoulder room for both front and rear seat passengers, and generally the vehicle is a wee bit more upmarket than the present fifth generation Isuzu pickup, but it is still very much a dual purpose working truck as opposed to a lifestyle truck. There’s a new 2.5 litre twin-turbo Euro-5 diesel engine with switchable two and four wheel drive and it will tow up to 3 tonnes. A payload in excess of a tonne also ensures that business users will be able to reclaim the VAT. It will be in the showrooms in June- along with the price.